I love a light wall canvas. I can simply add color through the decor and accessories. If/when I want to switch color schemes, a neutral background (like white, cream, or soft gray) makes it easy enough to do so. 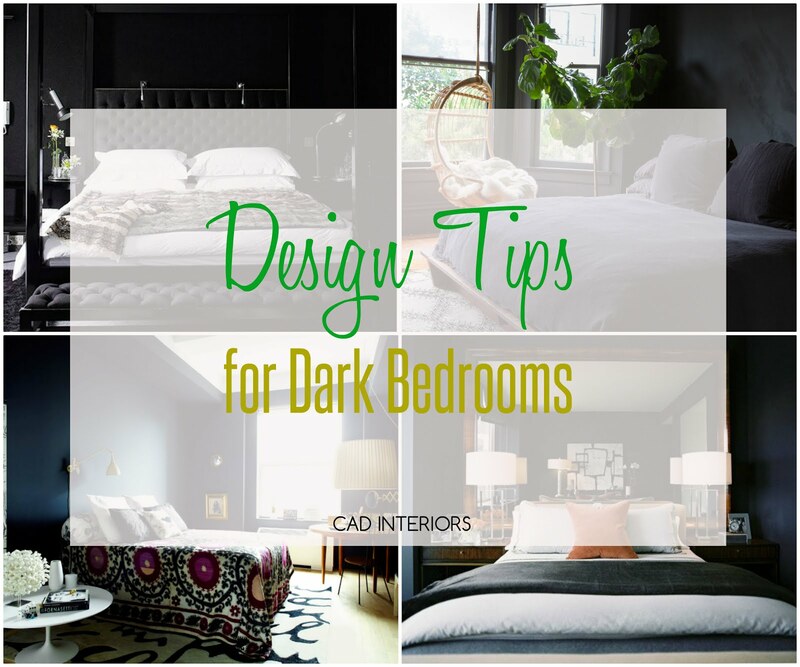 However, when it comes to bedrooms, specifically master bedrooms, I find myself drawn to the "dark side". 1. Use a satin or eggshell paint finish instead of flat. The sheen can subtly help bounce light around the room. 2. Bring in metallic elements, such as gold, brass, or silver. 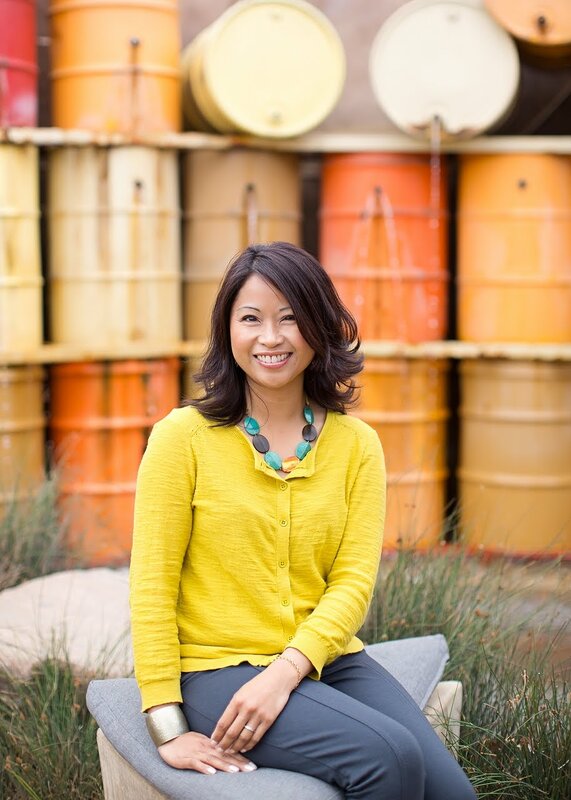 Metallics can infuse a layer of "richness" and depth. They can also help reflect light. 3. Keep the color scheme simple by using a combination of two or three colors, and perhaps tying it all together with a patterned textile. This can help a room from feeling busy or heavy. 4. Commit and play it up. Don't just stop at painting the walls a dark color. Go ahead and paint the window sill/trim, baseboards, crown molding, etc. Bring in "relief" by painting the ceilings white and keeping the window coverings light and airy. 5. Bring in nature and infuse some texture. Woven elements, fuzzy throws, textured rugs, rustic woods, and natural greenery can help add warmth, depth, and dimension in dark (or light) spaces. 6. Visually expand a room's dimensions by blending in same-hued furnishings with the dark walls. This will help everything recede. 7. Crystal or glass chandeliers can help increase the dramatic factor in dark rooms. They are elegant and romantic, and also provide femininity and "softness" within a dark, bold backdrop. 8. Mirrors are a common design trick to help visually expand space and reflect light. For greater effectiveness, use a large-scaled wall or floor mirror to help "open up" a dark-colored room. 9. Create stark contrast to dark walls by using light bedding, textiles, and artwork. When in doubt, black and white is a classic combination that is tried and true! 10. Proper lighting is essential in any well-designed space, and crucial in dark rooms. 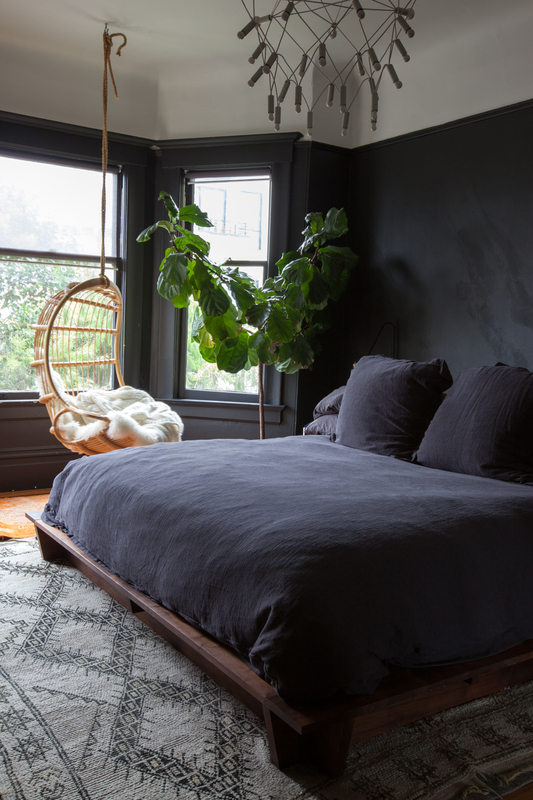 Bedrooms that receive a lot of natural light are especially great "candidates" for dark paint. Great post Carol! 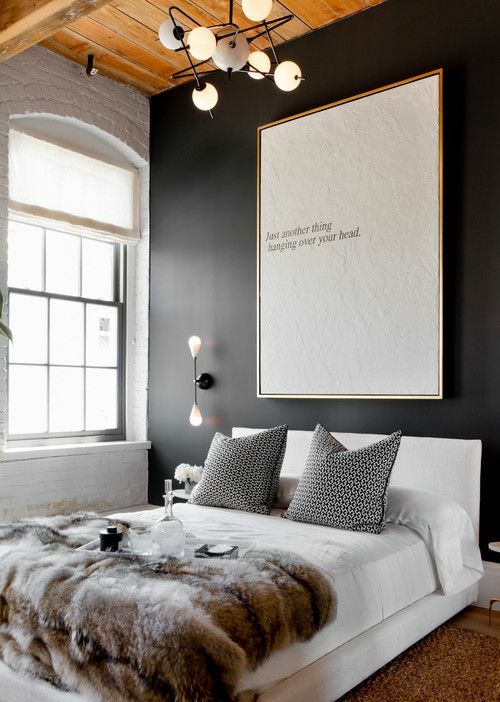 I love dark and moody walls in a bedroom. Our walls are a deep navy-teal and I love the color with white bedding! 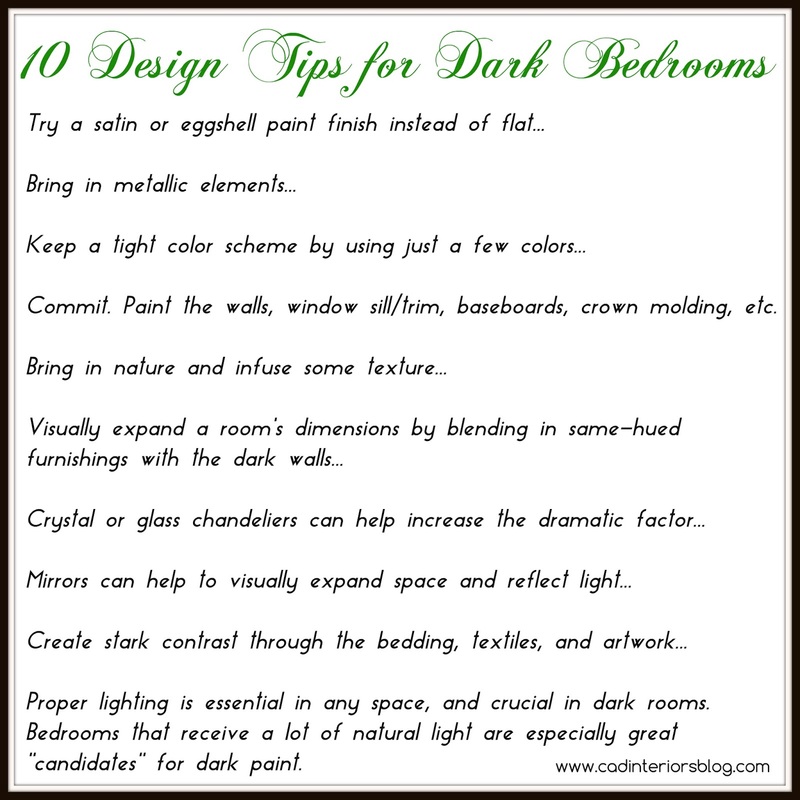 I love how dark bedrooms look, but I have never been brave enough to try it myself. I love your tips, they seem to include a lot about how to bring light in. I'm pinning them in case I can convince myself to try it.